We welcome your input and inquiries! 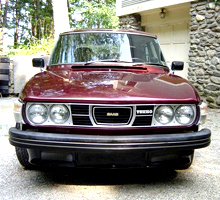 Please don't hesitate to contact us with your suggestions and questions, especially if you have questions about or need help adding your Saab 99 Turbo to the Registry. Click here to find Saabs for sale, Saab parts, other Saab-related items or to place your ad for a Saab item you're selling. Not for everyone. Essential to a few. Not for everyone. Essential to a few. featuring Billy Graham for sale. Click here to explore some great vintage documentations of the 99 turbos.